FILE - Iraqi Prime Minister Haider al-Abadi, center, attends a session of the Iraqi Parliament, in Baghdad, Iraq, Sept. 27, 2017. Iraq's Kurdish lawmakers are reportedly ending to their boycott of the national parliament. Iraq's Kurdish lawmakers are returning to Baghdad this week in an apparent end to their boycott of the national parliament, a senior Kurdish official said Thursday. The move is a concession to Baghdad after a military and political standoff that followed the controversial Kurdish independence vote in September. 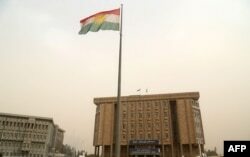 Kurdish lawmakers had announced they would return to parliament, but an Iraqi lawmaker, Josef Slewa, told The Associated Press that Kurdish legislators from Masoud Barzani's Kurdish Democratic Party did not attend Thursday's session. The KDP members had boycotted the parliament since it declared the Kurdish referendum unconstitutional just before the Sept. 25 independence vote. Renas Jano, a KDP lawmaker, said the lawmakers are returning to Baghdad in hopes that their presence in the Iraqi capital will bring the prime minister to the negotiating table. "We want to start dialogue with the central government," he said, adding that attempts to do so from Irbil, the Kurdish regional capital, have failed. FILE - The parliament building of Iraq's Kurdistan region is seen in Irbil, northern Iraq, Oct. 29, 2017. Iraqi lawmaker Razzaq Moheibis said the return of the Kurdish lawmakers was still under discussion and that they had violated the constitution when they campaigned and voted for the referendum. Earlier this week, the self-ruled Kurdish regional government accepted a federal court ruling that Iraq must remain unified. A statement Tuesday from the regional government said the court's ruling should "become a basis for starting an inclusive national dialogue." "It is a catalyst toward removing the impact of the unconstitutional referendum the region held," Prime Minister Haider al-Abadi's spokesman Saad al-Hadithi told the AP, referring to the statement. He added that the sides are now discussing technical issues and "when that dialogue achieves its goals it will be a prelude to starting a political dialogue." Iraqi forces led by Baghdad and the Kurdish peshmerga fighters have engaged in a military standoff since Baghdad retook the oil-rich city of Kirkuk and several other disputed territories from peshmerga's control last month. A senior U.S. official present at negotiations between Irbil and Baghdad warned that post-referendum, any Irbil-Baghdad dialogue is more difficult. "The referendum has made it much, much harder for Baghdad to conduct ... anything that sounds like negotiations in the near term," the official said, speaking on condition of anonymity in line with regulations. With Iraqi national elections due in May 2018, al-Abadi will be under pressure to maintain a hard line with the Kurdish region to appeal to his Shiite-majority base, the official added. The United Nations and the United States repeatedly warned the Kurds against holding the referendum, saying that it challenged the unity of Iraq. After the vote, al-Abadi closed the Kurdish region's airports to international flights, retook disputed territory and threatened to bring international border crossings under federal control. In his weekly press conference on Tuesday night, he warned the Kurds to hand over border crossings and airports to federal authorities. Baghdad "will not wait forever and will take measures," he added, without elaborating.